I’ve been making cornbread the same way for years and it never fails. This family gem comes from my Mom; she got it from her Mom, Lucille, and Lucille got it from her Mom, Zollie, aka “Jammer”. Even though we’ve never found an actual hand-written recipe from Zollie or Lucille, we do have an email from the 80’s sent from my Mom to my Aunt Darlene. Mom claims she got it in 1960, when she married my Dad. Tried and true. A classic. Some people want to challenge the cornbread and I can’t for the life of me figure out “why”??? Do you add sugar? Should it be fluffy? Can you add corn to it? All I can say is: cream gravy does not have parsley in it; chili does not have beans and cornbread is not light and sweet–in the South, we call that cake. There it is and I’m sticking to it. Cornbread goes with just about everything. Here we have a nice Irish dish: corned beef, cabbage, peas and….cornbread. And here, we’ve got a bowl of black-eyed peas and cornbread, with a green onion and a glass of champagne..perfect for New Year’s!!! Bean soup and cornbread. Simple. Healthy. Filling. Cheap. Delicious. Next time you’re in a quandary about cornbread, don’t be! Just use this tried and true recipe that works every time. 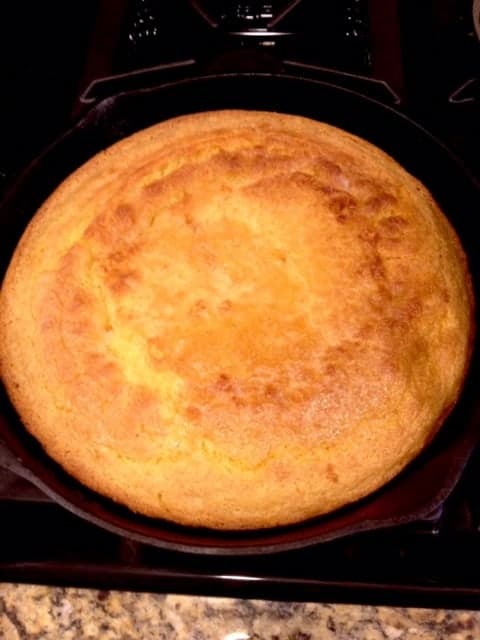 Southern cornbread is definitely a year-round item found on many a dining room table. 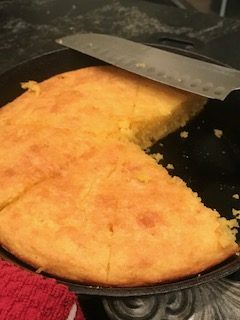 I don't think anyone can really lay claim to a cornbread recipe, but this is the one I was taught by my Mother and Grandmother. Cast-iron skillet with oil should be hot by now. Pour batter into the skillet and shake it to even out the batter. This step ensures a crusty bottom. Remove from oven; slice into quarters; melt butter on top and serve! Some folks like to add stuff to their cornbread like corn or jalapenos, or even cheese. If you add ingredients (and for God's sake No Sugar), just add it to the final batter. (This is the batter with both dry and wet ingredients). One final note: true Southern cornbread does NOT have sugar in it. I don't care if it is on the recipe of Aunt Jemima's Corn Meal package. Aunt Jemima's is out of Illinois; consider the source.